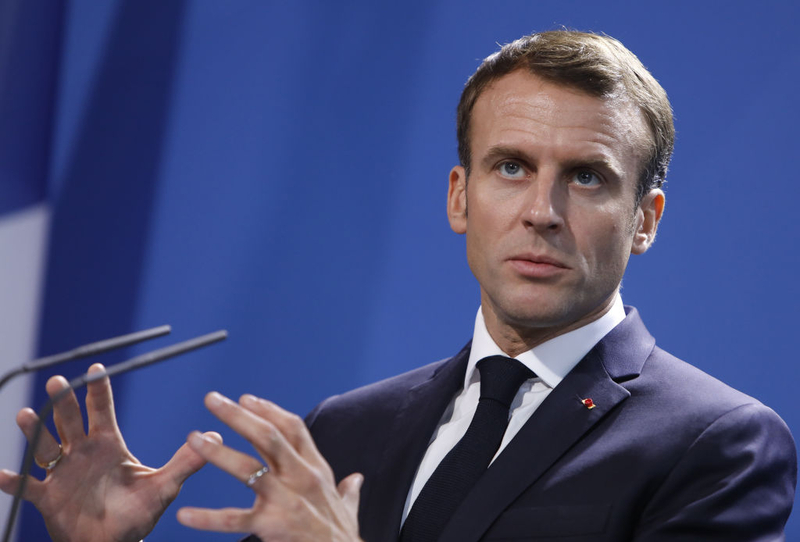 HomeGOVERNMENTFrance’s Meltdown, Macron’s Disdain – and Fall? France’s Meltdown, Macron’s Disdain – and Fall? 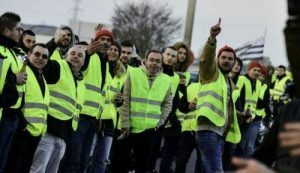 The “yellow jackets” [protestors] now have the support of 77% of the French population. They are demanding Macron’s resignation and an immediate change of government. European elections are to be held this Spring, 2019. Polls show that the National Gathering will be in the lead, far ahead of La République En Marche! [The Republic on the Move! ], the party created by Macron. him. In a pompous speech, Macron — knowing that a few days earlier, Donald Trump had defined himself as a nationalist committed to defending America — invoked “patriotism”; then defined it, strangely, as “the exact opposite of nationalism”; then called it “treason”. In addition, shortly before the meeting, Macron had not only spoken of the “urgency” of building a European army; he also placed the United States among the “enemies” of Europe. This was not the first time Macron placed Europe above the interests of his own country. It was, however, the first time he had placed the United States on the list of enemies of Europe. President Trump apparently understood immediately that Macron’s attitude was a way to maintain his delusions of grandeur, as well as to try to derive a domestic political advantage. Trump also apparently understood that he could not just sit there and accept insults. 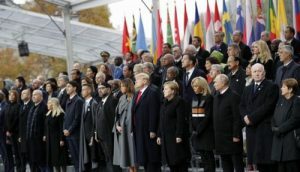 In a series of tweets, Trump reminded the world that France had needed the help of the USA to regain freedom during World Wars, that NATO was still protecting a virtually defenseless Europe and that many European countries were still not paying the amount promised for their own defense. Trump added that Macron had an extremely low approval rating (26%), was facing an extremely high level of unemployment, and was probably trying to divert attention from that. Trump was right. For months, the popularity of Macron has been in free fall: he is now the most unpopular French President in modern history at this stage of his mandate. The French population has turned away from him in droves. Unemployment in France is not only at an alarmingly high level (9.1%); it has been been alarmingly high for years. The number of people in poverty is also high (8.8 million people, 14.2% of the population). Economic growth is effectively non-existent (0.4% in the third quarter of 2018, up from 0.2% the previous three months). The median income (20,520 euros, or $23,000, a year,) is unsustainably low. It indicates that half the French live on less than 1,710 euros ($1,946) a month. Five million people are surviving on less than 855 euros ($973) a month. When Macron was elected in May 2017, he promised to liberate the economy; however, no significant measures were taken. In spite of some cosmetic reforms– such as limits on allowances for unfair dismissal or the slightly increased possibility that small businesses could negotiate short work contracts — the French labor code, still one of the most rigid in the developed world, expertly blocks job creation. The tax burden (more than 45% of GDP) is the highest in the developed world. Even if some taxes were abolished since Macron became President, many new taxes were created. Public expenditure still accounts for about 57% of GDP (16% above the OECD countries average) and shows no signs of waning. Macron also promised, when he was elected, to restore security. Lack of security, however, has been exploding; the number of violent assaults and rapes has been steadily on the rise. No-go zones are as widespread as a year ago and fiercely out of control. The influx of unvetted illegal immigrants into the country has sadly turned entire neighborhoods into slums. In May, Macron warned that in many suburbs, France has “lost the fight against drug trafficking“. 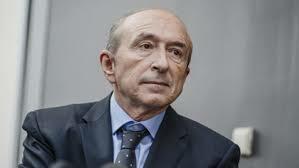 When Minister of the Interior Gérard Collomb (pictured) resigned on October 3, he spoke of a “very degraded situation” and added that in many areas “the law of the strongest — drug-traffickers and radical Islamists — has taken the place of the Republic.” He was simply confirming the chilling assessments of “out of favor” commentators such as Éric Zemmour, author of Le Suicide Français, and Georges Bensoussan, author of Une France Soumise (A Submissive France). Riots are frequent; they indicate the growing inability of the government to maintain order. Public transport strikes, which took place during the entire spring of 2018, were accompanied by demonstrations and an enthusiastic looting of banks and shops. France’s victory at the soccer World Cup in July was followed by jubilation, which quickly gave way to violence by groups who broke store windows and attacked the police. Since entering political life, Macron’s remarks have not only revealed a contempt for the French population, but also have multiplied. That has not helped. As early as 2014, when Macron was Minister of the Economy, he said that the women employees of a bankrupt company were “illiterates“; in June 2017, just after becoming president, he distinguished between “those who succeed and those who are nothing”. More recently, he told a young man who spoke of his distress at trying to find a job, that he only had to move and “cross the street”. During a visit to Denmark, he announced that the French were “Gauls resistant to change”. One of the few issues Macron did seem eager to work on was Islam. He stressed several times his determination to establish an “Islam of France“. What he failed to take into account were the concerns of the rest of the population about the rapid Islamization the country. In June 20, 2017, he said (not quite accurately, for example here, here, here, here, here and here), “No one can make believe that (Muslim) faith is not compatible with the Republic”. He also seems to have failed to take into account the risks of Islamic terrorism, which he hardly ever calls by its name. He seems to prefer using the word “terrorism“, without an adjective, and simply acknowledges that “there is a radical reading of Islam, whose principles do not respect religious slogans”). 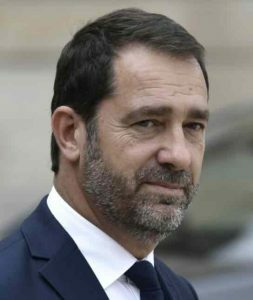 The current Minister of the Interior, Christophe Castaner (pictured), whom Macron appointed to replace Collomb, dismissed the concerns raised by his predecessor, and described Islam as “a religion of happiness and love, like the Catholic religion”. Another area in which Macron has acted relentlessly is the “fight about climate change”, in which his targeted enemy is cars. On vehicles over four years old, mandatory technical controls were made more costly and failure to comply with them more punitive, evidently in the hope that an increasing number of older cars could be eliminated. Speed ​​limits on most roads were lowered to 80 km/h (50 mph), speed control radars multipled, and tens of thousands of drivers’ licenses were suspended. Gas taxes rose sharply (30 cents a gallon in one year). A gallon of unleaded gas in France now costs more than $7. The small minority of French people who still support Macron are not affected by these measures. Surveys show that they belong to the wealthy layers of society, that they live in affluent neighborhoods, and almost never use personal vehicles. The situation is painfully different for most other individuals, especially the forgotten middle class. two days. On social networks, people discussed ​​organizing demonstrations throughout the country and suggested that the demonstrators wear the yellow safety jackets that drivers are obliged to store in their cars in case of roadside breakdowns. So, on November 17, hundreds of thousands of protesters blocked large parts of the country. The government ignored the protesters’ demands. Instead, officials repeated the many unproven imperatives of “climate change” and the need to eliminate the use of “fossil fuels” – but refused to change course. After that, another national protest day was selected. On November 24 (pictured below), the demonstrators organized a march on Paris. 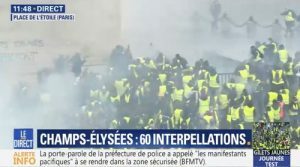 Many, it seems, decided, despite a government ban, to head for the Champs Elysées and continue toward the presidential Elysée Palace. had never done in the past. Although many of the protestors were holding red flags, indicating they were from the political left, the newly appointed Minister of the Interior Castaner said that the violence had come from a fractious and seditious “far right”. One member of the government fueled the fire by equating the French “yellow vests” with the German “brown shirts” of the 1930s. Macron declared that those who try to “intimidate officials” should be “ashamed“. Finally, on November 25, Macron ended up recognizing, with visible reluctance, the suffering of the “working classes”. Two days later, Macron delivered a solemn speech, announcing that he would create a “high council for the climate”, composed of ecologists and professional politicians, and that his aim was to save the planet and avoid “the end of the world”. He still did not utter a single word about the economic grievances that had poured forth during the previous ten days. The spokesman for the center-right party, The Republicans, Laurence Saillet, remarked, “The French say, ‘Mr. President, we cannot make ends meet,’ and the President replies, ‘we shall create a High Council [for the climate]’ Can you imagine the disconnect?”. Marine Le Pen, president of the right-of-center National Rally (the former National Front party, and today the main opposition party in France), said, “There is a tiny caste that works for itself and there is the vast majority of French people who are abandoned by the government, and feel downgraded, dispossessed “. 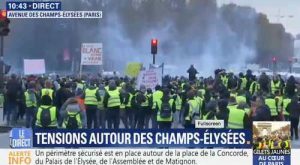 At the moment, the “yellow jackets” have decided to organize a third national protest – today, Saturday, December 1st — with another march to Paris and the Elysée Palace (see image). The revolt in the country is intensifying and shows no sign of slowing down. Britain on a Leash with the United States – but at Which End?